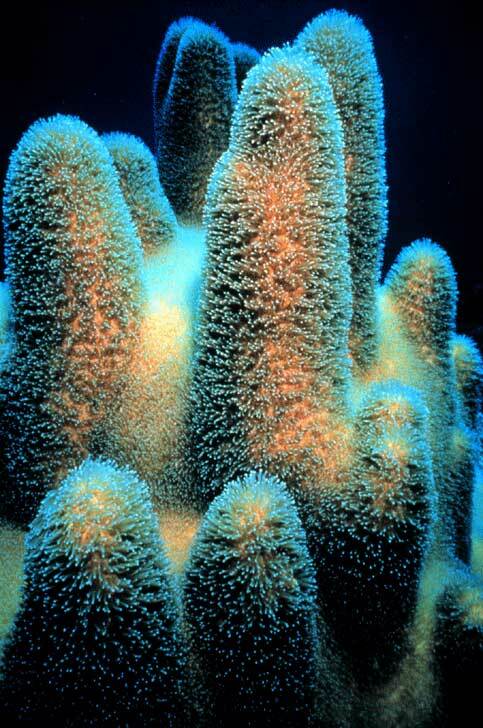 Contrary to what lots of people think, coral is not a plant that attaches itself to rocks, but is actually an animal. Magnificent, awe-inspiring coral reefs, some of them extending over hundreds of kilometres, therefore consist of millions of individual animals. This animal is a polyp. It's a simple organism consisting of a cylinder embellished with tentacles on its upper end. It's part of the family of anemones, but it has the particular trait of being able to extract calcium carbonate (CaCO3) contained in the water to produce the limestone skeleton it lives in. Simply put, it is an animal which has the extraordinary faculty of creating its own mineral shelter. But in order for coral to live and develop, different conditions are necessary. These conditions, which are essentially light, warm water and salinity, should remain stable over time, because any change can have dramatic consequences and threaten the survival of the individual coral and thus the reefs. For example, tropical coral reefs develop in an ideal range of temperatures between 25 and 29°, and extremes of between about 20° and 35° can be supported. Their growth is optimal at a depth of 20 metres and just under the surface of the sea, but below 60 to 70 metres, they no longer receive sufficient light and die, except for "ahermatypical" type species (see below). The distribution of coral also depends on the energy released by waves; a calm environment enables more fragile polyps to prosper, while logically large waves only allow for the presence of the most solid species. Is there such a thing as female coral and male coral? No, because coral is a hermaphrodite, this means that it possesses the astounding capacity of reproducing all on its own, because it produces ovules as well as spermatozoids.